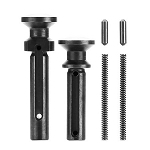 Gorilla Machining assembles your AR15/m4/m16 upper receiver from a manufacture stand point with the right torque spec to every part on the rifle. Inspecting that there are no metal burrs in the AR15 barrel's gas port. 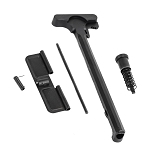 Knowing the AR15 gas block is installed straight and situated perfectly over the gas port seat. Knowing the gas tube is pinned correctly. Every little thing matter like the AR15 dust cover pin installed in the right direction and that its c-clip was not forgotten. It is our pleasure given you that satisfying feeling that makes us want to share it with you and what better way to do it than by putting all of the parts you'll need into one nice, neat, high quality, low priced package.